It’s a sad fact of life that thieves intent on stealing high dollar items to sell on, view warehouses as the perfect location for their illegal activities. Failing to have professional warehouse security in place is akin to openly inviting thieves in, and not only puts your inventory at risk but the safety of your staff too. For total peace of mind, you can protect your building, employees, and the goods that you’re storing by hiring professional security services that will patrol, guard, and respond to emergency situations 24 hours a day. How can a security service help you? Firstly, professional security guards are there to keep your employees safe. Stolen goods are a costly nuisance but at the end of the day they can be replaced. However, you can’t replace the life of an employee who may get harmed in a botched burglary. 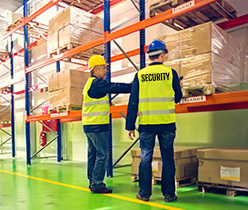 Rather than risking the life of any single member of staff, you can offer protection and lower your liability by hiring security guards to protect everyone that works inside your warehouse. Not only this, the presence of uniformed security guards will give your employees peace of mind knowing that they are safe in their workplace, and this fact alone has been shown to increase staff moral and production. While your warehouse may be targeted from the outside, unfortunately it can also be compromised by employees who are intent on stealing from you. It’s not always possible to watch the actions of every employee during the various shifts you have operating from your warehouse. Without proper monitoring in place, employees will find more opportunity of stealing work equipment or inventory, if they’re intent on doing so. This can hit your business badly and bring it to its knees. As well as their physical presence, security guards can also monitor any closed circuit TV, surveillance equipment, or videos that are placed at strategic positions in and around your warehouse. This is like having numerous pairs of eyes all closely watching the building and its occupants, without having to stand behind them as they work. Preventative measures such as these can help you recoup money that you may have lost previously to uncontrolled employee theft and it also allows you to get on with the job of running your business without having to keep an eye on your staff at the same time. Despite your best efforts emergencies can occur and when danger does strike, it’s imperative that you and your staff know what to do. With the presence of security guards, you have a trained professional who will give directions in unforeseen circumstances such as a fire, gas leak, flood, bodily assault, and shootings. Most security guards are trained in CPR and know how to keep injured people stable until the emergency services appear. Finally, security guards can also check the ID of all people coming and going from your warehouse, including vendors, delivery drivers, and staff to check they have the right credentials. They can also meet and greet visitors and direct them to the right place, acting as an ambassador for your business. A friendly, confident security guard can give a great impression of you and your business while also stopping any would be thieves in their track.